Well, some weekends are just weekends, but some weekends are more than weekends!! Today was one such weekend. 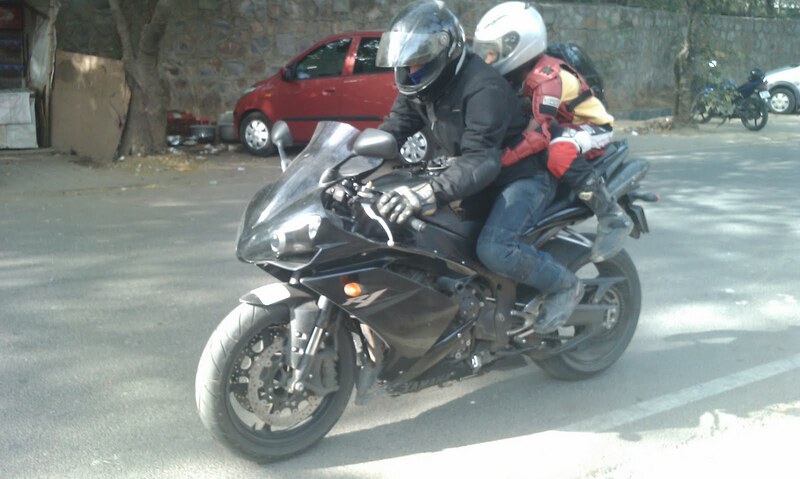 A weekend G2G was organized by Sunny from Xbhp to review a Super bike. We didn't knew what bike was supposed to be reviewed but the idea was a plain G2G and discussion. Started at around 6:00 am from home and reached the destination at 6:28 am at the Kutubh Institutional area. And there it was Sunny with a Honda CB1000R. 1) It's probably the only Japanese bike to feature a single sided swing arm like the Ducatis have. 2) The engine note is just awesome!! Copy book Super bike. 3) A monstrous 100Nm torque means that this bike is very practical for Indian conditions and being naked, the heat dissipation would also be good. Again with 123.37Hp of max power, this bike has all the usable power that an Indian biker can ever exploit in Indian conditions. So, having given the video review a skip, I walked around, listened to what others have to say about the bike, chatted with a few of them to know what they actually thought about the bike and to say the truth..... there were mixed reviews. So, as the day progressed, more and more bikes started to pour in!! Taking about Ken, boy I missed to click the video of the way he rode off with his son. In a flash of a second he just went ballistic. Really it requires some skill full riding and experience to do that with a beast like the R1. Well at around 8:30 am, I decided to call it off a day at the G2G, as on a Sunday, it's not good to leave wify alone for long for safety reasons ;). But really what a day it was, to meet persons like Sunny, Ken, Old Fox in person, to chat with them about bikes, about riding about pros and cons!! I say no post is enough express the excitement of being there and of-course seeing some of these monsters in flesh and their engine note!! The exhaust note of an inline 4 is really something right..?? I get a feeling that one day you will walk into a showroom and walk out with an exotic beauty.. Thanks for your wishes bro!! You are one guy apart from my wife and Doug (and sometimes my elder bro:)who has always encouraged me for my Superbike dream!! :D Thanks for being there man. Encouragement from your better half..?? Wow..!! Lucky..!! That R1 just looks like a man among boys in that picture! Have you been able to get out on one of those Ninja 250's yet? I still think that bike lends itself well to the riding conditions over there near you. That R1 really needs some open air to get the most out of it. I'm sure one day you will end up on one though! I do love the shot of the guy on teh R1 with his kid on the back both fully geared up.